Deep fry turkey, a recipe originating from the American south, is gaining popularity all over America as a fun, fetsive alternative to roasted or rotisserie turkey. Although it must be cooked outdoors, and although special equipment is needed, many people feel that the reduced cooking time and the phenomenal taste are worth the price of the equipment. Deep Fry Turkey is said to be moist, flavorful, and not at all greasy. 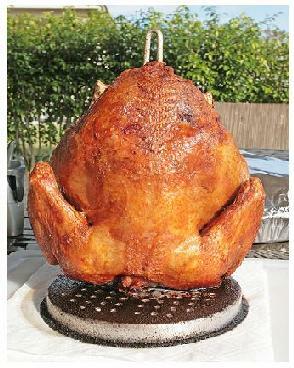 A turkey is deep fried in a special turkey fryer, which is basically a huge, deep, stainless steel pot. The pot must be large enough so the oil covers the entire turkey by about 2 extra inches, with still a few inches of space left at the top of the pot. 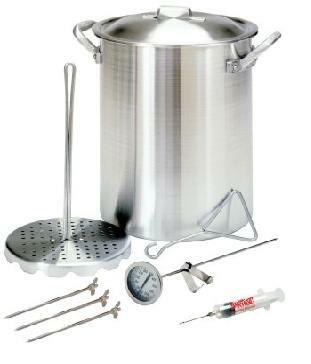 Turkey frying kits come complete with accessories, instructions, and recipes. These kits are available at your local houseware or hardware store. Injectible marinades are available at most supermarkets. 1) Thoroughly rinse the turkey in warm water. Remove all items packed in the body cavity. Pat the turkey dry with paper towels. 2) Pour several gallons (as needed) of oil into the pot. Best oils for this purpose are canola or peanut oil. 3) Heat oil to about 350°F (use candy thermometer to test temperature). This should take 20-30 minutes. 4) Truss the turkey, securing the legs, neck flap, wings and neck to the body of the turkey. 5) Fill your syringe with marinade and inject it into both sides of the breast, the legs, and the thighs of the turkey. 6) Rub the whole turkey with salt and pepper. 7) Turn off the burner, place turkey into turkey hanger (basket) and lower it CAREFULLY into the pot. TURKEY MUST BE DRY AND AT ROOM TEMPERATURE, or the oil will splatter. 8) Turn burner back on. Cooking time is about three-and-a-half minutes per pound. So a 12 pound turkey will be done in about 40 minutes. 9) Remove turkey and check the temperature with a meat thermometer. The temperature should be 170° F in the breast and 180° F in the thigh. Go here for Low-Cost Car Insurance in Every State.